Looking for true comfort? You just found it. Ekornes Stressless recliner chairs offer the comfort and luxury you’ve been searching for. The highest quality materials + highly skilled craftsman + contemporary and modern Scandinavian design = one-of-a-kind Stressless recliners designed to enhance any room in the house. Ekornes uses only the best woods, leathers, textiles, and finishing’s to create high-quality, luxurious recliners. When you sink into the plush leather cushions and lean back into the supportive back and headrest, you’ll instantly discover the Stressless commitment to quality. Above all? Your comfort is their top priority. Each Stressless recliner contains the patented Stressless Glide and Plus systems as well as the ErgoAdapt system designed for you to experience ultimate comfort and luxury. Glide System – By adjusting your body weight and position in the chair, the Glide automatically wheels to the desired setting for your body. Plus System – The Plus system automatically adjusts to support your head, neck, and lumbar position. ErgoAdapt System – The ErgoAdapt system tilts the recliner to just the right angle as soon as you sit down. With Stressless, no recliner is one-style-fits-all. Stressless recliner chairs can be customized to fit your home décor and match your personal style. Choose from leather or upholstery and select the wood stain you prefer. When you choose Stressless recliner chairs, you’re guaranteed to receive the style you love and the comfort you’ve been searching for. What is a “Stressless” chair or recliner? The Stressless recliner is a furniture designed for the first time in 1971. Since then Ekornes has continued to develop and improve upon the original design with the main goal of providing the highest levels of comfort. Stressless recliners are leather chairs that supports your neck and lumbar spine. Ekornes is the inventor of the Glide System that makes the leather recliner follow your body’s movements to adjust to a perfect position. The recliners also come with adjustable ottomans that complete the comfort from head to toe. How much do stressless recliners cost? Each model has a different price point and pricing depends on the size and the fabric you choose. That said, Stressless recliners prices typically range anywhere from $1,695 on the low end to $4,895 on the high end. While those prices might seem high, please remember that Stressless furniture is built to last and many families proudly pass down their furniture over generations. You can find information about the models and pricing by checking out our selection above. We also regularly run specials and discounts on certain models, please check our Stressless recliners sales page for more information. Are stressless recliners worth the price? The Stressless recliners are one of few recliners produced in the world with a warranty of ten years. The Stressless chair is flexible, functional, and comfortable like no other design in the genre. It is priced to be accessible, and through extensive development and testing, Stressless furniture is meant to last a lifetime. Do stressless recliners rock and swivel? Yes. 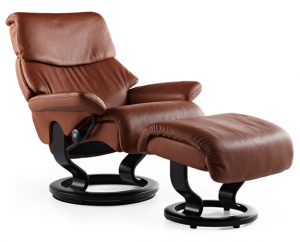 Ekornes Stressless recliners are one of the only recliners endorsed by the ACA. Stressless seatings aims to help customers prevent back pain through ergonomic seating designed to fit varying consumer needs. Your back will benefit from the soft pillows and high back. And because bodies are different Ekornes Stressless tries to help customers of any size find a properly fitted chair, many of our Stressless recliners are available in small, medium or large sizes to accommodate all sorts of people. What materials are stressless recliners made of? Leather, fabric and wood. Stressless recliners are available in four types of leather and fabric to choose from and come in a full range of beautiful and design-friendly colors. The Stressless base is made from European beech, and is available in a range of finishes. You can view and experience all our different types of leather, fabrics and wood in our Stressless showroom or on our site. Do stressless recliners last a long time? Most certainly! Stressless furniture is made to last a long time and many customers have models that have been in their family for a generation! Ekornes furniture is best known for its comfort and longevity. Purchasing a Stressless recliners is an investment — and with proper care your investment should last you 20 years or more. Instead of spending money on new, lesser quality recliners year-in and year-out, investing in a Stressless recliner is a purchase that will provide you comfort for a generation. Are Stressless recliners easy to care for? Avoid having your recliner in direct sunlight for very long periods of time. If your preferred sitting location has lots of light, try to limit the direct exposure. Try to avoid extremely dry conditions. Relative humidity that is comfortable for you is best for your leather recliner. Gently vacuum debris and dust from the leather. Do not use microfiber wipes on your leather recliner — this can pull out essential oils in the leather and shorten the lifespan. You should start taking care of your leather furniture as soon as it’s in your home. Use our Stressless leather care kit on all leather surfaces, neck rests, armrests, seats. The care kit will help nurture the leather and keep it resistant to stains, including grease and perspiration. For daily care, simply wipe down the leather seating areas with a moist cloth, then buff with a soft, dry cloth. Clean frequently is recommended wherever hands, bare arms or heads rest against the hide. Avoid excessive wetting or rubbing. Can I order different sizes of stressless furniture depending on my height? Yes, almost all of our models that come in different sizes — Small, Medium, and Large. Ekornes understands that no one person is built alike, and their chairs are built to accommodate people from 4’9” to 6’6” tall — and 90 to 300 lbs+. The height, weight and seat depth of the sizes is explained in the descriptions of models.